Pest Control is the management or elimination of insects, rodents, and wildlife that have become pests of humans. For insects, pest control usually means killing and discarding of single pests or whole insect populations. What if those "pesky" creatures could be put to good use instead of being killed and discarded? In ancient cultures, insects were used as medicines, and today, scientists are rediscovering many of these natural cures as well as new ones derived from insects. From proven lab results to medicines and supplements sold in countries less regulated than the U.S. to the ancient arts, following are some proven and some legendary means in which insects were or are used to cure a variety of human ills. Stitches – As far back as 3,000 years ago, the mandibles of soldier ants have been used as stitches. The ant, most commonly carpenter, leaf-cutting, or army ants, were held so as to open their jaws. The mouth was then placed around the wound to be stitched and the mouth allowed to close. The ant's body was then pinched away, leaving the head to clamp the wound shut. Wound healing – In ancient times, red ant droppings were sprinkled on wounds to help them heal. Additionally, maggots and honey have been used to heal chronic and post-surgical wounds instead of conventional dressings. Wound cleaning – Maggots eat dead tissue which can clean open wounds. According to Entomon.net/Dreamcatcher Global, "about 5,000 laboratory-grown microorganism-free maggots get delivered to hospitals across the United States every week." Burns – Bee's honey may help to relieve and heal burns; it has also been combined with beeswax to relieve psoriasis, atopic dermatitis, and diaper rash. Cancer – Lab research has shown that compounds derived from blister beetles can be effective in treating certain cancers in cell cultures. Additionally, a scorpion venom extract has been shown to be able to detect and spotlight cancer cells under a special light used during surgery. Cancer and Aging – Extracts of the Chinese Black Mountain Ant are mixed with a drink (often wine or beer) and consumed. The extracts are currently being studied for its potential against cancer. Bronchitis, pneumonia, convulsions, hemorrhages, and frequent urination – In some cultures, pupae of the Bombyx mori silkworms are boiled and eaten, and larvae excrement consumed to reduce cholera symptoms. Antibiotics – Termite feces, house fly larvae extracts, blowfly peptides, and bee-generated resin may be even more effective than antibiotics in killing fungi and bacteria. Insects Cure the Common Flu and Headache? Flu – FDA recently approved the flu vaccine, Flublok, which is derived from cells taken from the ovaries of the fall armyworm moth. Diarrhea - In days of old, red ant droppings were crushed and eaten to help cure diarrhea. Fever reducer and stomach calmer – The larva of the Jatropha Leaf Miner is a major agricultural pest which has been boiled then mashed into a paste and applied to the affected area. Headache pain – Grasshoppers are dried and ground into a powder, then mixed with water and ash to form a paste that is applied to the forehead. Headache pain to lockjaw and snakebites – Centipedes are dried, ground to a paste, then applied to the area of pain. Warts - Blister-beetle compounds were also used to treat warts. Toothache – In ancient times, dead mice, hippo teeth, and wolf ashes were used to treat toothaches. Today's scientists have found that teeth coated with an adhesive substance secreted by mussels can rebuild an enamel-like layer. The substance may prove to be a beneficial ingredient for sensitive-teeth toothpaste. Longer Life? – Male silkworm extracts have been shown to extend the lives of fruit flies … possibly humans too? Lowered Cholesterol/Anticoagulants – Insect skeletons could provide compounds that would help lower cholesterol and thin the blood. 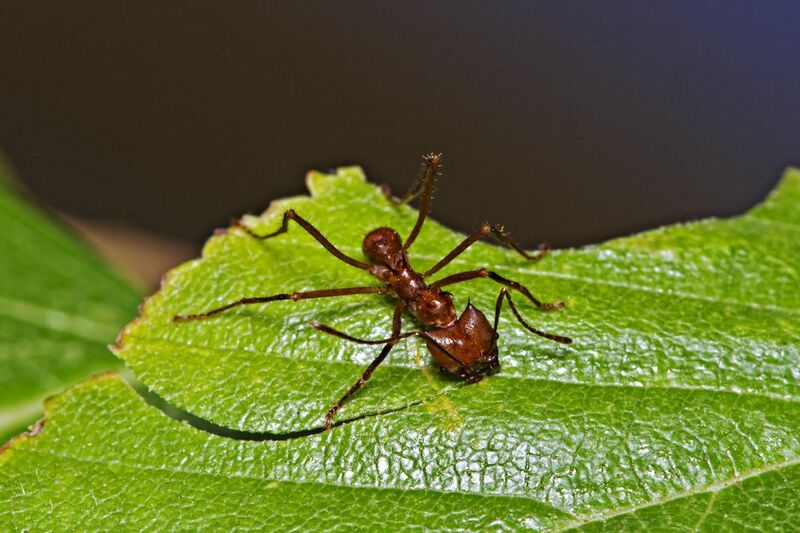 Rheumatism/Arthritis – The venom of the devil-tree ant (Pseudomyrmex triplarinus) and bee-generated resin have been shown to contain anti-inflammatory proteins that could provide relief for arthritis. A U.S. patent is pending on the chemical. Products containing the bee resin (propolis) are sold in the U.S. as a supplement for reducing pain and inflammation. Ulcers and anemia – Termite mounds are dug up – with termites inside – and ground into a paste which is applied to the affected area or mixed with water and drunk. Whether each specific insect-derived cure is lab tested, an ancient art, or an old wives tale, there is a distinct benefit to the overall study and use of insects in medicine. Perhaps, as is stated in Bugs as Drugs, combining the healing insects with conventional treatment may prove to be of greatest benefit.